If you were to ask me who'd be the couple you enjoyed working with the most, I'd tell you it's Sarah and Graeme without a doubt. They are so easy-going and just down for anything. The bride and groom held their wedding at Golden Gardens Bathhouse in April. As you know, you only get sunshine in Seattle during the summer. In other days of the season, if you were to have a wedding, you'd just hope for a nice cool weather as long as it doesn't rain. On the wedding day for Sarah and Graeme, it's been the case all along. It was drizzling but we still managed to take some first look pictures outside the house. Until the end of the ceremony, right when we were about to go out and take some couple portraits, it started raining hard! I really don't think the picture here do it justice of how terrible the weather actual was. It was pouring. I was really worried about if we were able to step outside. Regardless, I quickly ensembled my flash with modifier. As soon as I turned around, Sarah was already in rain boots and Graeme got the umbrella ready in his hand. I asked, "ready to go play?" Without any hesitation, Sarah goes, "yeah let's do it!" They are definitely the most fearless couple I have ever worked with. We got soaking wet as soon as we stepped outside. The wind was also blowing hard so the rain was hitting us sideway. We did not stay outside for long. Thankfully I managed to snap a couple of shots. I absolutely take pride in myself in this photograph. It really represents the mood of Seattle in the best way possible. You never know what to predict for Seattle's weather. More often or not you just gotta think on your feet and make the best out of it. 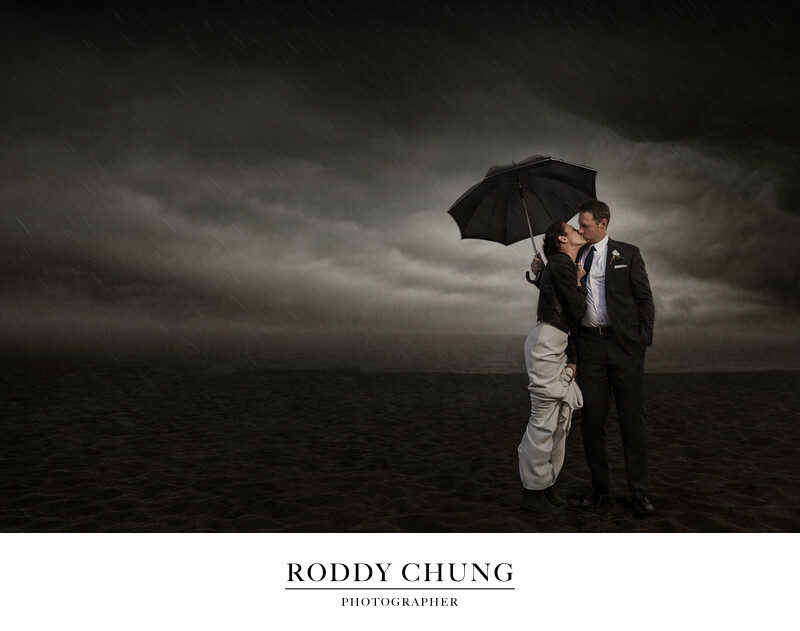 In fact, I felt fortunate to have a weather like this so I could create such as dramatic, gloomy, and fine-art portrait for the bride and groom. Keywords: golden gardens (3), Seattle Wedding Photographer (3), seattle wedding photography (6), wedding portrait (15).